› Topics› Chemicals›REACH – What is it? Regulation EC 1907/2006 is the European Chemicals legislation concerning the Registration, Evaluation, Authorisation and Restriction of Chemicals (REACH). It entered into force in 2007 and aims to ensure a high level of protection of human health and the environment. At the same time it ensures the free circulation of chemicals on the internal market while enhancing competitiveness and innovation. The basic principle of REACH is that producers, importers, and downstream users assume responsibility for their chemicals. They must ensure that the chemicals they produce and market are used safely. The abbreviation REACH is short for Regulation concerning the Registration, Evaluation, Authorisation and Restriction of CHemicals. REACH is one of the world’s strictest laws governing chemicals. REACH builds on the experience gained from previous chemicals law. Under previous law, the responsible authorities were in charge of evaluating chemical safety. There was no systematic information available about most of the chemicals on the European market, i.e. on chemicals which had been in circulation before 1981. Producers only obligation was to provide information when an evaluation by authorities had proven gaps in knowledge about the chemical or there was evidence of potential harm to the environment or human health. This procedure proved to be slow and cumbersome – something which REACH aims to eliminate. Producers and importers of chemicals must now provide information with the registration and carry out their own evaluations of associated risks. The basic principle ‘No data, no market‘ means that substances shall not be placed on the market without prior registration. It is the task of the authorities to support all stakeholders, to check registration dossiers and to consider Substances of Very High Concern or substances that are associated with risks for mankind and/or the environment. REACH also addresses other problems. 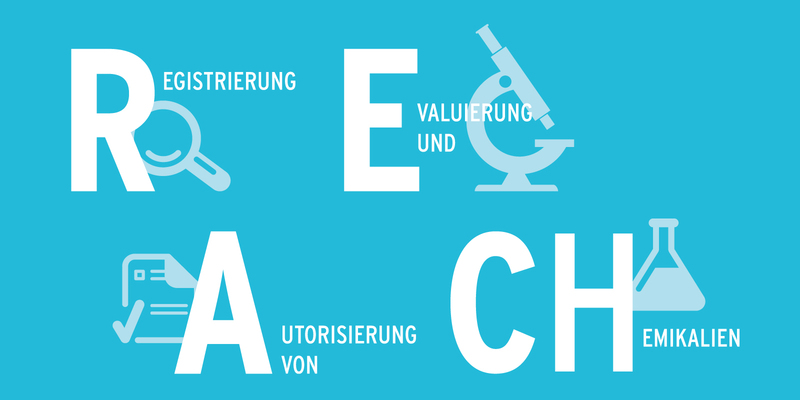 It grants consumers a right to information in German about chemicals in articles. The communication of information along the supply chain is regulated, and it is a major aim to substitute Substances of Very High Concern. The authorisation procedure in German is another means of chemicals regulation.